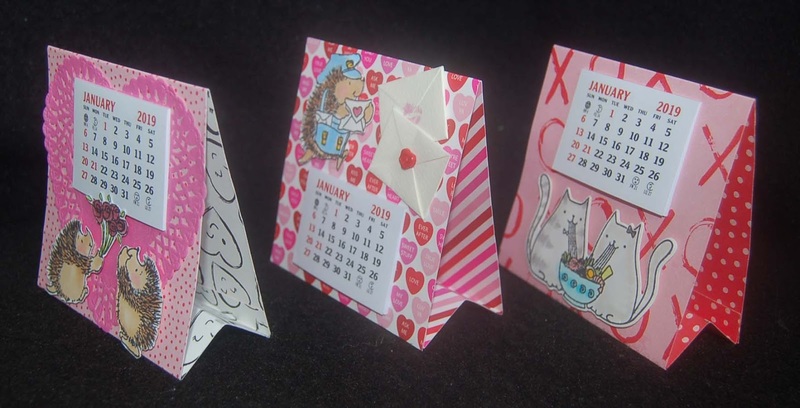 As promised, here are larger versions of the previously posted mini-calendars. These accordion pleated Valentine calendars have 4"x 4" front faces. 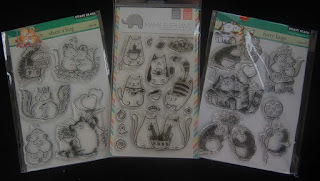 I started with 4" x 10-1/2" strips of double sided card stock. These are scored at 4", 8", 9" and 10". After folding the accordion pleats the last edges are sealed with double stick tape. 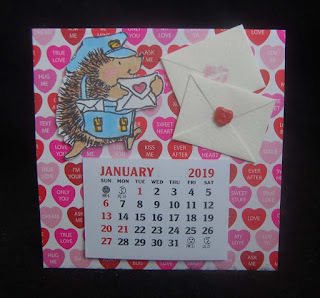 This cute Penny Black hedgehog postman was colored with Copic pens and fussy cut. 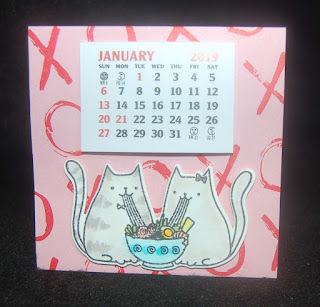 Two envelope stickers were added to balance out the calendar. 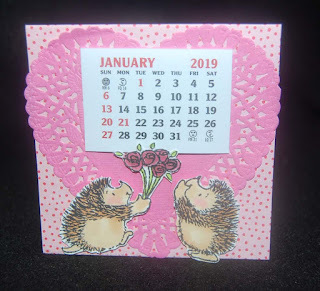 For this calendar I used a Mama Elephant stamp image which I cut with a matching die. I think the simple graphic background helps to make the saimin-eating cats stand out. I happened to find a pink heart doily in one of my Valentine stash boxes. It was the perfect backdrop for the two hedgehog lovers. A little Wink of Stella sparkled up the roses...unfortunately this was not captured by the camera's eye. These calendars are perfect little Valentine gifts to mail with sweet messages written on the backs. 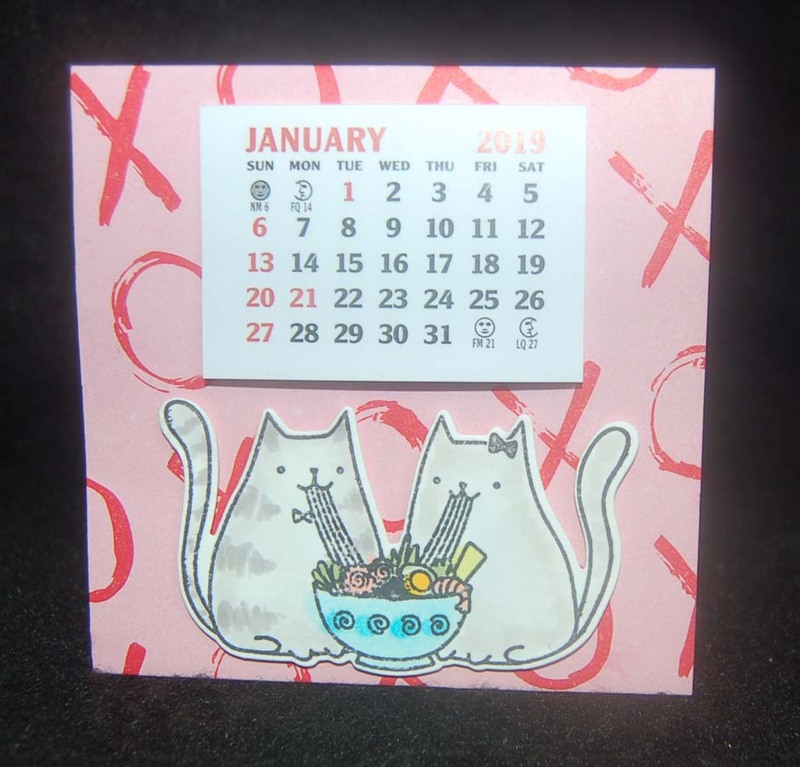 They are also an excellent way to use up leftover card stock and my slowly dwindling supply of Vippie calendars. I guess I will be making Easter calendars next. LOL! These are so cute and what a fun idea!